Home » Corruption, World news » Americans take lawful stand against Federal encroachment on constitutional rights. Americans take lawful stand against Federal encroachment on constitutional rights. Armed U. S. Army Paratroopers from Bravo Company, 2nd Battalion, 505th Parachute Infantry Regiment, 82nd Airborne Division, illegally patrol New Orleans' famous French Quarter. Obama's National Defense Authorization Act (NDAA) for Fiscal Year 2012 deems the US people as the enemy. There are some really exciting things happening that every American needs to know about. If you are sick of the wars, bailouts, surveillance, foreclosures and corruption then read on. Everyone needs to act now in order to restore lawful government. Considering the nature of the NDAA just passed, and nuclear war by provoking Iran is on the horizon, people need to wake up quick. The National Defense Authorization Act (NDAA) for Fiscal Year 2012 was signed into United States law on December 31, 2011 by President Barack Obama. Obama described the Act as addressing national security programs, Department of Defense health care costs, counter-terrorism within the U.S. and abroad, and military modernization. The Act also imposes new economic sanctions against Iran (section 1045), commissions reviews of the military capabilities of countries such as Iran, China, and Russia, and refocuses the strategic goals of NATO towards energy security (taking control of all of the World’s oil by force). It is for this reason that the PRESS Core editor has started up a new energy website called frenergy.ca. This new website is meant to inform and educate the public that the World does not need oil. Not a single drop of it. Energy is free and always has been. Energy is renewable. No one in the World needs to pay 1¢ for energy. Every person on Earth can make their own renewable and 100% free energy. NATO has now been tasked to protect the energy security of a handful of un-American corporate gangsters. For 99.99999999% of the World population energy means power that drives their cars, heats and lights their homes and businesses, cooks their foods, pumps and boils water, … and everything we need to live out our lives. For 0.00000001% energy means slavery. The 0.00000001% seek to enslave the World’s future generations through energy. If everyone in the World started making their own energy there would be no Rothschild bankers, there would be no wars, there would be no pollution, no cancer or disease, no Global warming, no corruption and no debt. Countries fail only because of debt. Debt is only created through interest bearing loans from loan sharks like the Federal Reserve banks and other unconstitutional and anti-sovereign central banks. The most controversial provisions of the National Defense Authorization Act to receive widespread attention and condemnation are contained in Title X, Subtitle D, entitled “Counter-Terrorism.” In particular, sub-sections 1021 and 1022, which deal with detention of persons the government suspects of involvement in terrorism, have generated controversy as to their legal meaning and their potential implications for abuse of Presidential authority. Although the White House and Senate sponsors maintain that the Authorization for Use of Military Force (AUMF) already grants presidential authority for indefinite detention, the Act states that Congress “affirms” this authority and makes specific provisions as to the exercise of that authority. The detention provisions of the Act have received critical attention by, among others, the American Civil Liberties Union (ACLU) and some media sources which are concerned about the scope of the President’s authority, including contentions that those whom they claim may be held indefinitely could include U.S. citizens arrested on American soil, including arrests by members of the Armed Forces. This is a willful gross violation of US laws. The Fifth Amendment (Amendment V) to the United States Constitution, which is part of the Bill of Rights, protects against abuse of government authority in a legal procedure. Due process is the legal requirement that the state must respect all of the legal rights that are owed to a person. Due process balances the power of law of the land and protects individual persons from it. When a government harms a person without following the exact course of the law, this constitutes a due-process violation, which offends against the rule of law. The Fifth and Fourteenth Amendments to the United States Constitution each contain a Due Process Clause. The Supreme Court of the United States interprets the Clauses as providing four protections: procedural due process (in civil and criminal proceedings), substantive due process, a prohibition against vague laws, and as the vehicle for the incorporation of the Bill of Rights. The boss of Blackwater / Xe / Academi / XPG / Greystone Ltd. Erik Prince has been accused in court papers of seeking to wipe out Muslims. Blackwater founder Erik Prince views himself as a Christian crusader tasked with eliminating Muslims and the Islamic faith from the globe. A must watch video given by Keith Olbermann in regards to white supremacists, Christian religious fanatic Blackwater Erik Prince. If you go to Blackwater’s Greystone Ltd. website you will see that they are involved in aviation as well. On their main page there is an image of Blackwater personnel loading a helicopter into a cargo plane that has the name Volga-Dnepr on the side. Volga-Dnepr is an airline based in Ulyanovsk, Russia. It operates scheduled and charter passenger and cargo services, but specialises in outsize cargo operations using the world’s largest fleet of Antonov An-124 aircraft. The picture reveals another activity of Blackwater – International arms dealing. Has anyone ever seen a colored Blackwater mercenary? I have only seen white Blackwater mercenaries. Why do you suppose that is? The Untold Story of Gun Confiscation After Katrina. The above image is of a fake badge. Could you tell the difference if someone wearing this broke down your door in the middle of the night and assaulted you? If it wasn’t a cop you have the legal right to use lethal force in self-defense. You probably wouldn’t resist if you believed it was a cop conducting a legal raid or arrest. This is what the US government is counting on when they send mercenaries to kidnap or kill you. A split second hesitation could mean the difference between life and death. L.A. Times photos from a federal raid on a medical marijuana clinic in California. 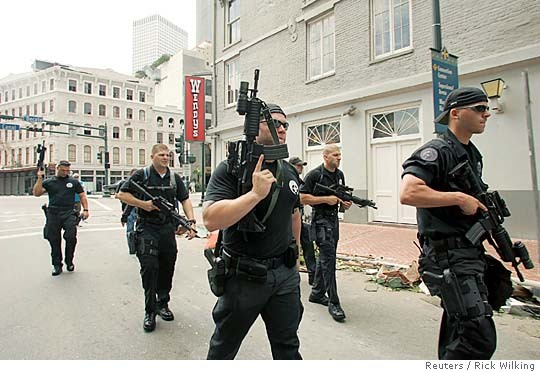 Armed Blackwater in New Orleans in aftermath of Hurricane Katrina. Blackwater mercenaries in Iraq. Shooting at anything that moves. Blackwater “we have a runner in a white shirt”. Sniper fires several times. The man pictured above riding in a boat with US soldiers was more than likely a Blackwater (formed in 1997 renamed Xe in 2009 and renamed again Academi in 2011) hired gun. A police state was formed with the formation of Blackwater in 1997 – during the bill and Hillary Clinton administration. The planning for the false flag attack against the United States on September 11, 2001 also took place during the Clinton administration. Since 1997 Blackwater has been carrying out illegal raids against the United States people using fake police badges. Today if the US government wants something done and it is illegal they give the job to Blackwater / Xe / Academi. This picture is your first look at what is coming in the United States. US soldiers and mercenaries impersonating police officers patrolling and carrying out attacks against the United States people on US soil. Blackwater founder Erik Prince has very good reasons for hiding out in Abu Dhabi, the capital of the United Arab Emirate. He is a wanted man. Not by the US government. By those who served in the wars in Iraq and Afghanistan. Blackwater killed US soldiers in Iraq and Afghansitan. Blackwater planted IEDs and shot and killed US soldiers to keep the wars going. Today Blackwater / Xe / Academi has a contract with the US government to kidnap, torture, and kill US citizens on US soil. They were training during Hurricane Katrina for 2012. British subject (born in Kenya) Barack Obama intends on being the last president of the United States. There will be no election in 2012. Obama knows he will not win another term. Plan A failed last summer when the United States military foiled 6 false flag attacks against the United States. Those false flag attacks involved detonating nukes on US soil. If Plan A succeeded the United States Constitution would have been suspended indefinitely and martial law would have been imposed in the United States. There were actually 2 nuclear detonations last summer – both on August 23, 2011 – both underground. Had the US military not intercepted those nukes Washington DC and New York City would be radioactive today and the US people would be prisoners in their own country. Plan B calls for attacking Iran and start WWIII. The US government will start a war with Iran via Israel. Plan B called for Israel to attack Iran using nukes. The first attempt at starting the war was averted as a result of a major cyber attack on Nov 6, 2011 against the Israeli government , Mossad, IDF, banks and and the Shin Bet security services. Hackers shut down the entire Israeli defense, intelligence, banking, and government systems to avert WWIII. The attack came just days after Israel had test-fired a ballistic missile capable of reaching Iran from the Palmachim base. Foreign intelligence knew what Israel was planning and prevented it from launching the US government’s (dictator Obama) Plan B.
Obama is today finalizing Plan C.
No military involved. No out of state police armed with and clutching a loaded automatic assault rifle. Search and rescues are the responsibility of the local police and emergency responders like firefighters. In a flood or any other natural disaster the people are the victims. They are not the enemy. The unlawful Task Force Katrina wasn’t a search and rescue operation. George W Bush ordered US forces to search and seize all weapons from New Orleans citizens (Americans) in direct violation of the Second Amendment. The Second Amendment (Amendment II) to the United States Constitution is part of the United States Bill of Rights that protects the right of the people to “keep” and bear arms. It was adopted on December 15, 1791, along with the rest of the Bill of Rights. If you click on the image above of the “Illinois” State Police and US soldiers in a boat you will see a badge that says “Illinois State Police”. Bush used out of state police and the military to violate the rights of the State of Louisiana and its people. Proof that this was not a search and rescue operation. The out of state police is armed with an automatic assault rifle. It has an ammo clip attached. Below his badge he has another 2 ammo clips. The automatic assault rifle has a combat scope attached. His cap also reveals to us that he is clearly outside of his jurisdiction. Only Louisiana police can police its citizens. The fact that an out of state police is in a boat with his hands clutching a loaded automatic assault rifle and accompanying a posse comitatus on US soil gives evidence that major crimes were willfully committed against the United States people, against the State of Louisiana and its citizens and in violation of the rule of law – the United States Constitution.